Moshe Rabeinu: "A man of Elokim"
"[Noach was] a Tzaddik, complete in his generations." The Tzaddik, through the holy deeds that he performs, draws the blessed, exalted Creator down into this world. It emerges that he does a favor for his generations (i.e., for the people living in his time), for he brings them the privilege of the Divine Presence resting with them via the Tzaddik. [Moreover], by rising to a higher level, the Tzaddik connects and elicits G–d's exalted Name in all the worlds. This is the deeper meaning of the verse, "a Tzaddik, complete in his generations"—that his complete righteousness benefited his generations. It is written: "Noach 'made walk' with Elokim," for his righteousness even benefited the higher spiritual realms (alluded to by the divine name of Elokim). He would even bestow (G–dliness) upon them. This is the deeper meaning of the phrase, "with Elokim." This refers to the higher spiritual realms, for even there Noach would "make walk" (i.e., elicit G–dliness). The Tzaddik's every action reveals G–dliness in the world in a way that illuminates the darkness for regular people. Moreover, when the Tzaddik rises to a new level, this brings G–dliness to be revealed in all the worlds. I.e., not only does the Tzaddik illuminate our lowly world, but he brings additional illumination to the higher spiritual realms. One of the main differences between the path of Chabad and of other Chassidic groups (also known as Chassidus Chagas), is in the way that they relate to their Tzaddikim in terms of the divine service expected of the chossid. The Chabad path says that a Rebbe is a boost and an aid, but not a substitute for striving to reach high levels of connection to Hashem through lengthy study of divine greatness and prayer, while for other groups the focus on belief in the Tzaddik is the main requirement and means of reaching inspiration in serving Hashem. Hisva’aduyos 5717, Vol. 1, p. 104. Lit., “Polish Chassidus”; this refers to an approach, not a location, as many groups associated with this path were not based in Poland, although not all were. This is perhaps similar to the way that all European Jews are called Ashkenazim when compared to Sefardim, although of course they did not all live in Germany. Thus, this expression is not intended to be derogatory, G–d forbid. Why does the date palm allude to the Tzaddik? This tells you that just as the date palm appears beautiful, and all its fruit are sweet and good, so is the son of David (Moshiach) pleasant in appearance, and all his deeds are sweet and good before Hashem. The Zohar and the sages of truth (i.e., the Kabbalists—Kabbalah is known as “the wisdom of truth”) wrote that the son of David is himself the soul of Adam. Adam is an acronym for Adam, David, Moshiach. Thus, the spirit of Adam is the same as the spirit of Moshiach. If everyone agrees that nothing was created on the first day, how can Rabbi Yehoshua ben Levi assert that “the soul of Moshiach” was created on the first day? Won’t people come and suggest that Moshiach created the world? The sages said that “the spirit of Elokim” refers to “the spirit of the king Moshiach,” who includes the souls of all of Yisroel. How pleasant is their statement that “Yisroel (the Jewish people) and Hashem are one” (Zohar 3:73a). ... Rather, it is certain that this (Hashem and the soul of Moshiach, which includes all Jewish souls) is a total unity (“achdus gamur”). This matter is well-known from the holy Zohar and (other holy) books. Mentioning Moshiach on the first day of the world’s existence does not lead to heretical claims because Moshiach is a Neshama Kelalis, a general soul, which contains all the souls of the Jewish people. Moreover, at their core the Jewish people and Hashem are totally one. The soul of Moshiach thus represents a level of holiness so great that it reveals this essential unity between the Jewish people and Hashem. Only mention of a separate entity such as an angel would lead to heretical challenges, but mention of the soul of Moshiach, a Tzaddik who personifies the utter unity of the Jewish people and Hashem, does not imply any plurality in the divine, G-d forbid, and thus would not prompt such claims. This teaching fits nicely with the explanation of Chassidus Chabad discussed here (and elsewhere) concerning the various verses and rabbinic statements that appear to identify the Tzaddik with Hashem. Chassidus explains that the Tzaddik’s tremendous bittul—complete lack of ego and utter self-effacement to Hashem—enables Hashem to shine openly in the world through him, and this is what is meant by those surprising statements. Moshiach, who will be a very great Tzaddik, will surely possess this quality. Here the Yakar MiPaz develops this general notion by explaining that Moshiach’s bittul simply reveals the G–dliness that is his inner self—the core oneness of the Jewish people with Hashem. This oneness is especially expressed in Moshiach because he is a Tzaddik who is a Neshama Kelalis, a general soul which contains the souls of all the Jewish people. It should be noted that only the Tzaddik of the generation is on the level to act as a Neshama Kelalis for all the Jews of the generation. In contrast, Tzaddikim not on this level only act as a “mini-Neshama Kelalis” for their own disciples (see, for instance, this post). This would seem to add explanation to the Rebbe’s famous statement (Hisva’aduyos 5746, Vol. 1, p. 343 and elsewhere): “The Nasi of the generation is the Moshiach of the generation.” Since Moshiach is a Neshama Kelalis that contains the souls of all the Jewish people, it is specifically the Tzaddik who is a Neshama Kelalis of this kind—viz., the Nasi of the generation—who qualifies as the Moshiach of the generation, the one who will merit to be revealed as Moshiach and actually bring the redemption if Hashem deems the generation worthy. How deep should be the relationship between the Tzaddik and his followers? Moshe Rabeinu of blessed memory acted as an intermediary between the Jewish people and Hashem, may He be blessed. He connected the Jewish people to our Father in Heaven, through their connecting with him, and his connecting with Hashem, may He be blessed. This is the meaning of the verse: “The entire congregation of the children of Yisrael went out—from before Moshe” (Shemos 35:20). This means that even though they had gone out, they were still in Moshe’s presence. 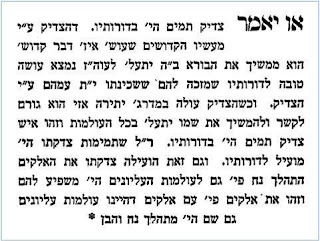 This is an admonition to future generations to bond with Tzaddikim, who are on the level of Moshe, with a strong, firm, lasting bond. Then even if one is not actually (physically) with them (the Tzaddikim), the impression and engraving (of the bond established with the Tzaddikim) will remain with them. In this way they will be constantly connected to Hashem, may He be blessed. 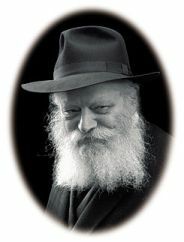 Rabbi Menachem Mendel Kasover, Ahavas Shalom, Vayakeil, s.v. vayetzu. The Tzaddik’s profound connection with Hashem enables his followers, who connect with him, to connect with Hashem on a far deeper level. Thus, the deeper one’s bond with the Tzaddik, the deeper one’s bond with Hashem. So by the follower establishing a bond with the Tzaddik that is so profound and intimate that he constantly feels that he is in the Tzaddik’s presence, he is elevated to a point where his intimate connection with Hashem will also continue uninterruptedly. It appears [to me as follows:] It is known that after their passing from this world, each of the Tzaddikim returns to the source of his Neshama, whether in Asiyah, Yetzirah, Beriah, or Atzilus—each one according to the place where the root of his Neshama is held. As is also known, it is written that since Moshe said to G–d, “and if not, erase me from Your book,” Moshe’s name was not mentioned in this entire Parsha. For his word made an impact, and it became necessary for some small measure of death to be fulfilled for him. Although he lived in this world for another forty years, approximately, it appears that the aspect of death that was fulfilled for him was that he became more attached to G–d than before. In a way similar to the [greater] attachment of Tzaddikim to G–d after their passing from this world. Similarly, he connected himself to G–d in his lifetime more than he had before. Rising from one level to another is an aspect of death, as is known. This also answers the above question of the Zohar, concerning the reason that in this Parsha it is written, “And you shall command ... And you shall draw near to yourself ... And you shall speak,” using an expression that implies that Moshe himself will command. This is because he attached himself to G–d to such an extent until he came to be on the level of G–d, as it were; [thus,] he himself had the power to command. For that which he was commanding was as if G–d was commanding, due to his tremendous attachment to the divine. I said this concerning the verse, “See, I make you as Elokim to Pharaoh, and your brother Aharon shall be your prophet.” [I explained that] Moshe was then on the level of Elokim, as he is called, “a man of Elokim,” and Aharon was his prophet. So, too, here. This is the level of death that was fulfilled for him, such that his name was not mentioned in this Parsha, for he became attached to G–d while still alive to the extent that Tzaddikim reach after their passing. Thus, through this he reached the level of Elokim. The intelligent one will understand. Rabbi Shmuel ben Naftali Hertz, Atara LeRosh Tzaddik, pp. 57-58. Zohar Shelach 159b; see Mikdash Melech and Ramaz.